On what appeared to be a reasonable day, albeit low of temperature, we at first decided to give Thursley a shout; until a last minute forecast deciding Bramshill was the better option. The problem with Thursley is the wind speed can make or break a visit; and I’ve had more disappointment than success on such days. Bramshill on the other hand provides several sheltered pockets which have proved bountiful on each of my visits. It was also ripe for more exploration. My choice was further confirmed by more careful study of google maps. There were a few ponds I’ve not previously found. The traffic did all it could to prevent us getting there, but arrive we did and headed straight to the possible entry point of these ponds. Of course in fine Bramshill tradition these secrets weren’t going to give themselves up easily. 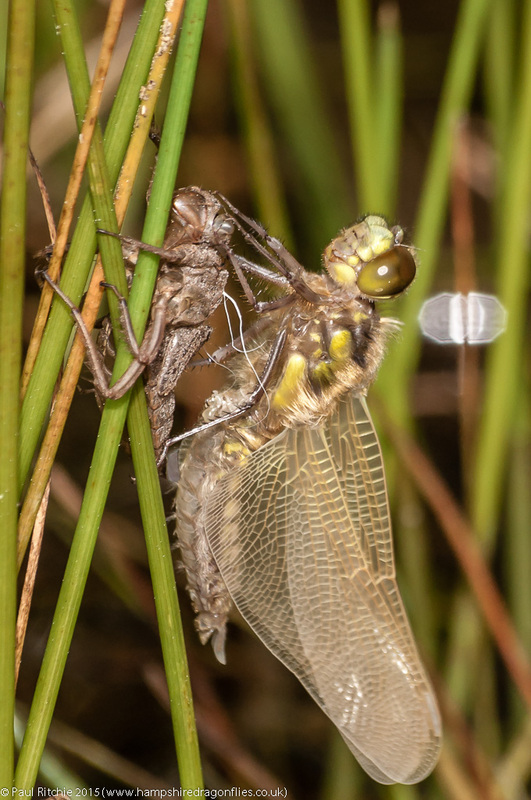 After failing to locate them initially we headed for Long Water where there was a delightful level of activity from patrolling Four-spotted Chasers, at least half-a-dozen Downy and a fine array of damsels. Sue had already expressed delight due to the easy access and fine display, and once I showed her the sheltered coves she was even more convinced. Sheltering in these little coves were most of the the days cast, with our first Emperor, Black-tailed Skimmer and at last a resting Downy. And a female to boot! Just a shame about that annoying blade of grass! Naturally removing it had the expected response! Sue’s initial delight was soon put to the test as I led her into the large clearing. I guess she was expecting an easier ramble without having to fight her way through obstructing growth, but to me the rewards exceed the minimal discomfort. I’ve experienced much worse, and having take three attempts last year of finding this spot, I wasn’t about to give it up. Alas not too many dragonflies this time, but a fine population of Grizzled Skippers and some tatty Green Hairstreak. While Sue rested I decided to take the hidden door to those elusive ponds, and once I negotiated the drop found a way through the trees, a large clearing opened out to reveal three ponds. The second of these had a patrolling Hairy while the third had my first patrolling Emperor of the season. 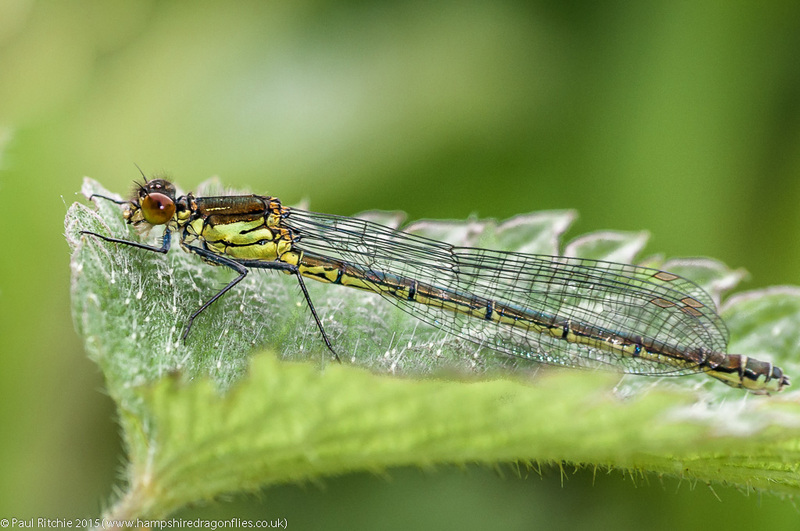 Unfortunately the cloud increased and it was getting noticeably cooler, and returning to Long Pond I noticed all previous activity had ceased, with just a few hardy damsels braving the chilling gusts. 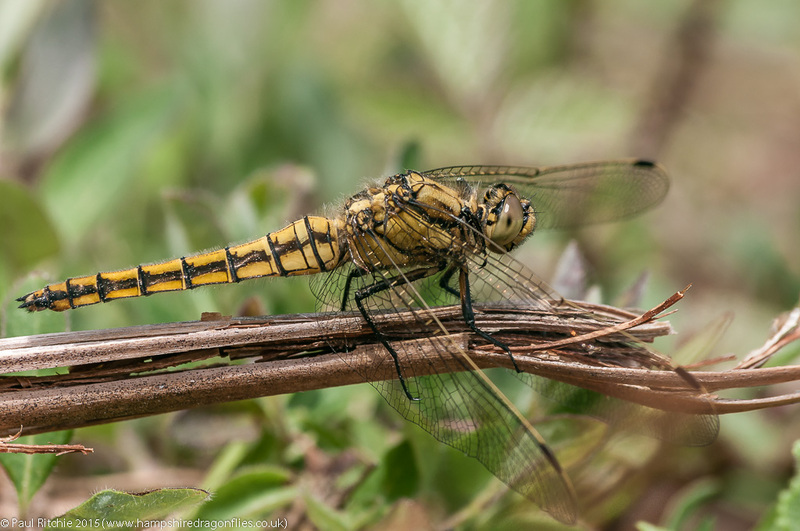 One more round along Emperor Alley to find an obliging female Black-tailed Skimmer for once off the ground. 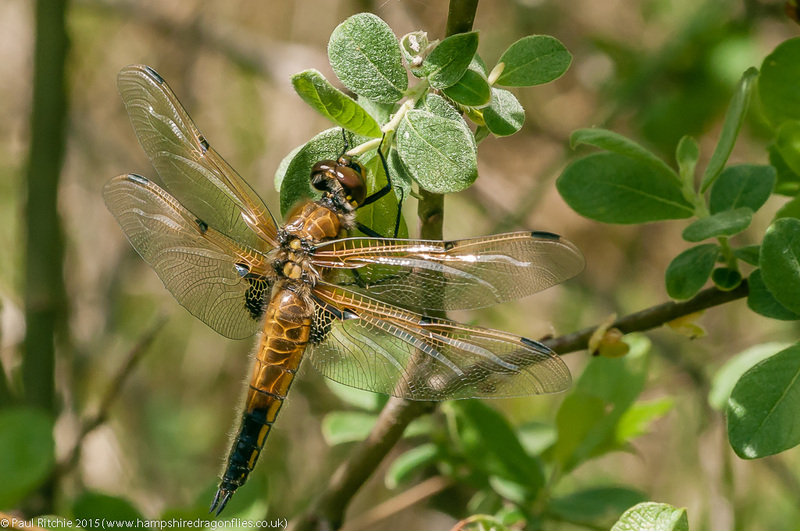 A final trounce alone around the large clearing, this time producing a few Broad-bodied Chaser. A count of a dozen species on such a day is more than expected, so an enjoyable excursion. Bramshill has yet to reveal all her secrets and needs a full day to appreciate its many delights; something I intend to put right this season. After a couple of days cold turkey we decided to pop into Swanwick. 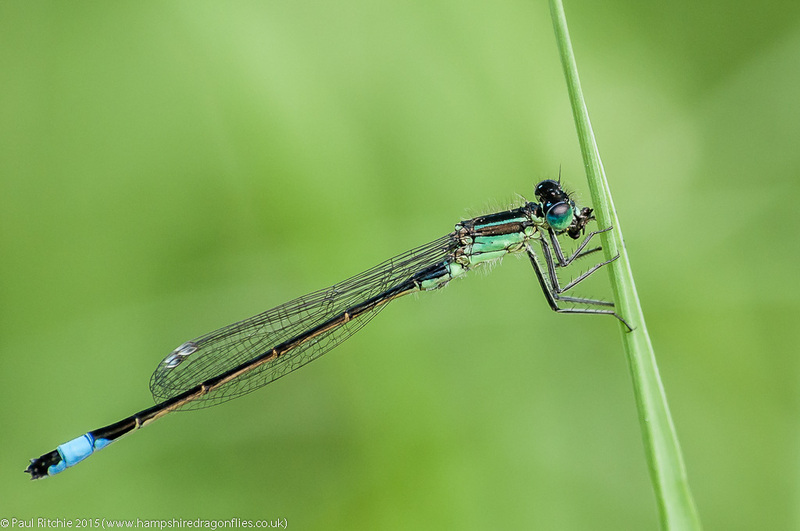 The conditions didn’t lend themselves to larger species, so I decided to concentrate on the damsels sheltering in grassy margins. By far the most numerous were Azure, with a scattering of Large Red, Common Blue and Blue-tailed to offer some diversity. I still enjoy the sight of the stunning rufescens (immature) female form, but a male can stand out while snacking. A brief sojourn then, but one to practice with the monopod. I had a message from Doug saying he’s taking the day off to track down the Downy at Brownsea Island, so we met early and decided to embark from Poole; a decision we regretted as soon as they asked for the extortionate £10.50 fare. It’s nearly half that from Sandbanks. Eager to get started, we headed to the old winery building where Doug had struck lucky before, but the lawn margins behind proved the better option, catching the warm rays of the late morning sun. 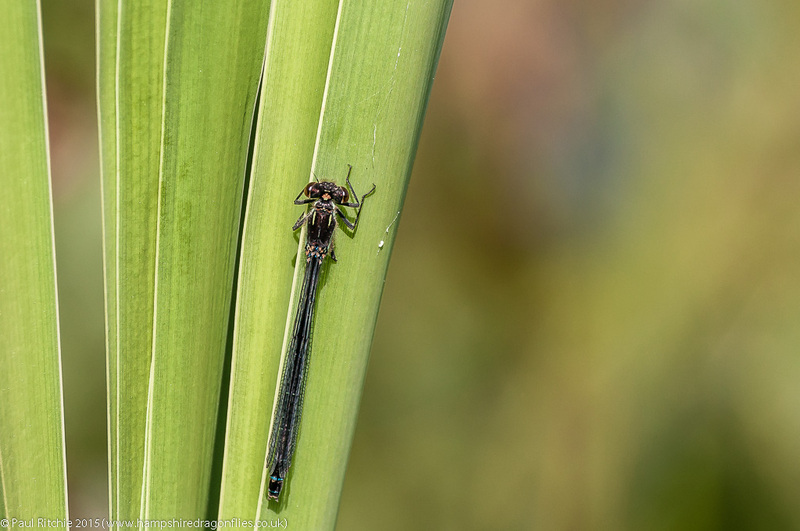 It was here we spotted our first Downy, along with several Four-spotted Chasers, Black-tailed Skimmers and Emperors – the latter two being new species for us both this season. We continued up the hill to the ‘picnic’ lawn where once again the sun-drenched margins provided more of the same, but those Downy were proving hard to pin down. Over on the heath the Downy once again stuck to the margins, whereas the heather threw up several more Emperor, Four-spotted and Black-tailed; all proving difficult to pin down in this non-too-friendly terrain. 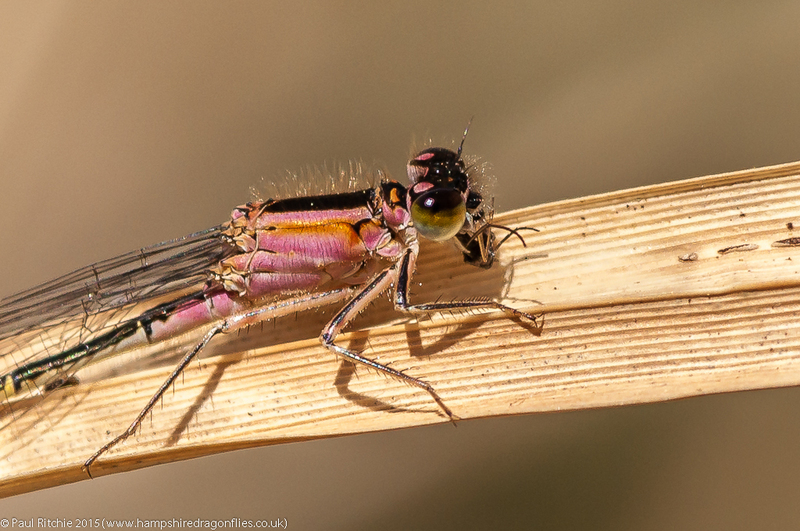 Put it this way…if dragonflies had ears it would have been impossible! Every time they’d land low down, making a clean shot impossible. We returned to the lawn area and just waited for fly-ins, of which there were many. The Emperors in particular provided a fabulous display as they flew very low down above the grass, offering fine glimpses to the numerous picnickers. In a small, sheltered thicket we came across several more of the same, but those damn Downy were up in a flash, taking to the trees and frustrating the hell out of us. As things grew quiet I took advantage of a Four-spotted who perched perfectly. I’ve had easier days, and from a photography point of view, far more successful, but it was a joy to see so many in a relatively small area; especially the fine display of Emperors. The spectacle is worthy of a visit, but prepare to be fleeced! Besides the cost of the ferry (10.50 from Poole, £6.50 from Sandbanks), there is the cost of parking (time dependent, but expect to pay around £8.00), an entrance fee once you reach the island (£6.10) and should you fancy the boardwalk, bird hides and other delights of the DWT area, they’ll charge you another couple of quid! 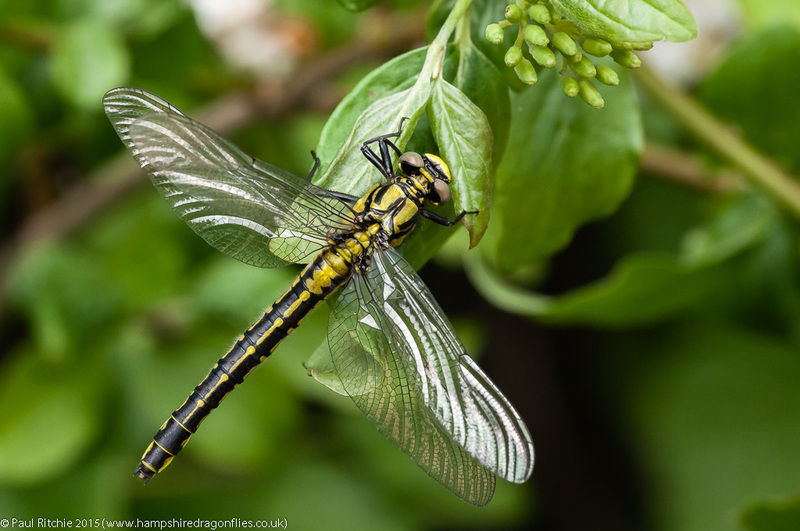 A while back I received a request from Marc Heath for help locating the Common Club-tails on the Thames. As I hadn’t been for a few years, it seemed like a perfect excuse to reconnect with this rare and stunning species. Marc was accompanied by Adrian Dowling and I with Sue, and after greeting each other in the car park, we headed through the gate to access the bank; our first decision whether to turn left or right. The ball was thrown back to me and I chose left; having found exuvia along the river on my last (scouting) visit. It wasn’t long before Sue spotted the first, then second, both rising high with the latter perching high but offering our guests their first view of a new species. Although not conveniently perched for photography the joy and excitement from our guests was infectious. 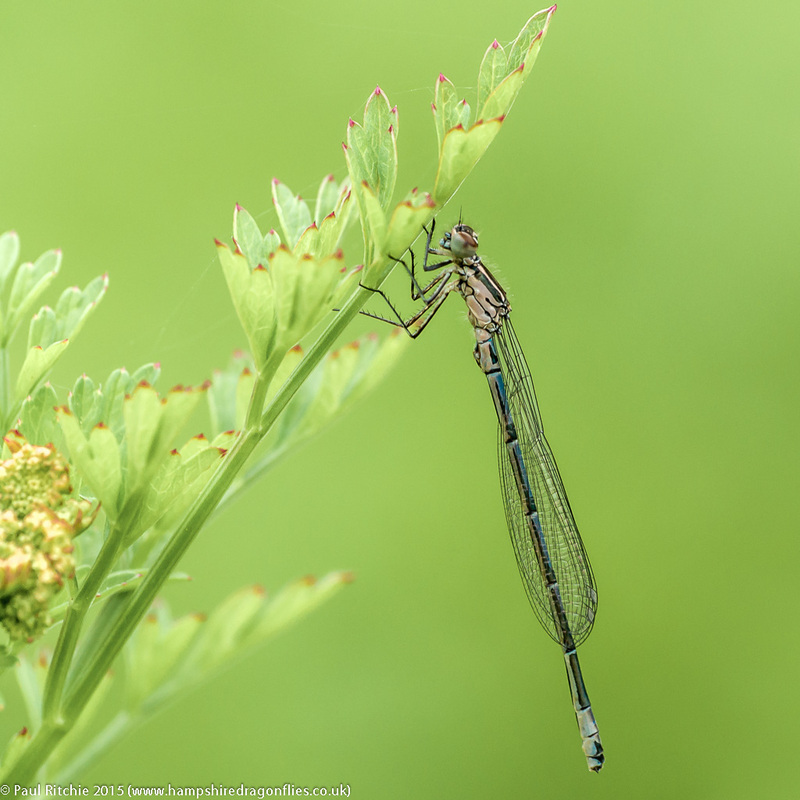 Sue having bagged the first two sightings meant it was my turn to find an individual we could all get close with, and shortly afterwards I did – sheltering from the breeze in a stand of nettles. 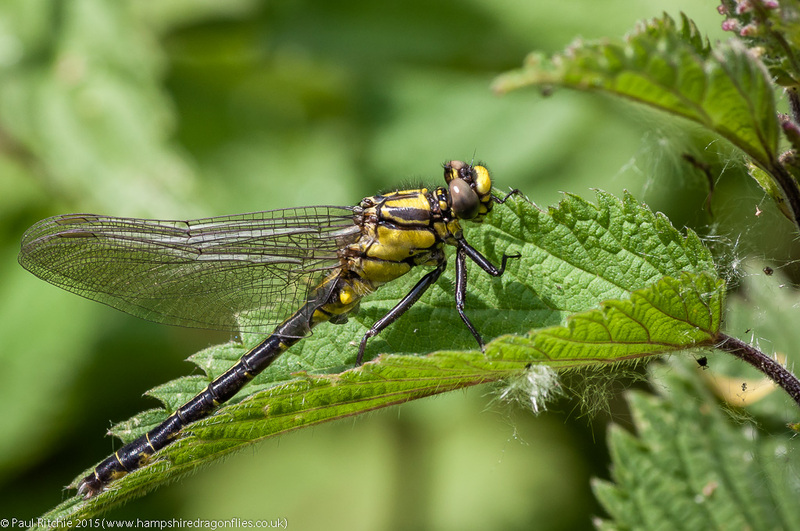 After we had our fill, a decision also reached by our subject as she rose above the treeline, we continued along the bank searching the undergrowth at the water’s edge and the frequent stands of nettles. I had walked ahead to check the small inlet where the exuvia were when I noticed one rise from the bank. We couldn’t have wished for a more willing subject. We carried on our search, reaching a grand total of seven individuals seen. We knew it would probably be impossible to find a better opportunity, and after a stroll downstream we returned to the car park satiated and said our goodbyes. A better day could not have been had! I decided to check out the ponds at Longham Lakes, but on arrival I had a good view of the horizon scattered with varying grey tones, with a few blue highlights. I didn’t find myself under many of the latter. Unsurprisingly the ponds were devoid of life, excepting a few hardy damsels hanging on for dear life to the swaying reeds. That wind was a potential problem again, but in such conditions you seek out the shelter. Sunshine wasn’t necessarily a factor for making hay. 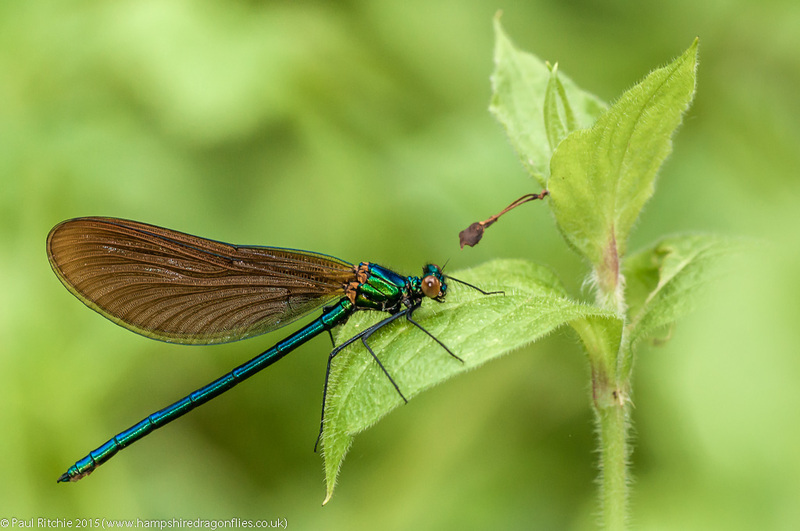 After some considerable time waiting for the sun to break through, I decided to seek a way through to the river, finding Banded Demoiselles decorating the overgrown nettles along the path. After I’d had my fill I decided to move on to Troublefield. Best to take advantage now while the meadow remains untrampled and eaten. It was a far cry from Somerset, but there was just enough to keep me occupied. 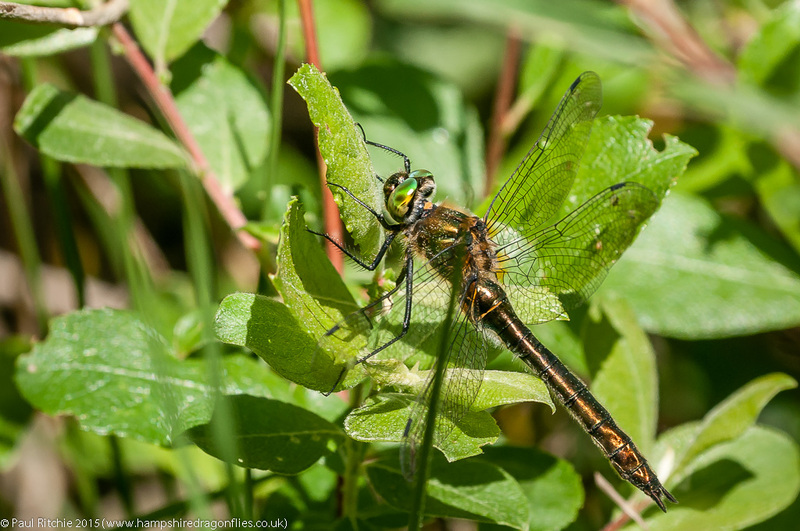 I had the option to travel east, north or west (south not really being an option from Southampton) and chose west for the Downy Emerald at Higher Hyde Heath. As I arrived I bumped into Frank and Dennis from Flickr. This was their local patch and they showed me the disaster of the pond. A couple of years ago the bank had breached, threatening complete draining and the destruction of the footpath. Since then the landowners have ‘repaired’ the bank with clay and gravel which proved to be a temporary remedy rather than a cure. The result is a constant draining of the pond, leaving vast sections barren. This certainly explained the lack of dragonflies. Even the sanctuary of the back bank was empty, the Downy obviously forsaking this reserve. There was one hunting along the trees, and, after getting lost & trapped negotiating the ponds at the back of the heath, another hunting the main clearing, which I failed to pin down. 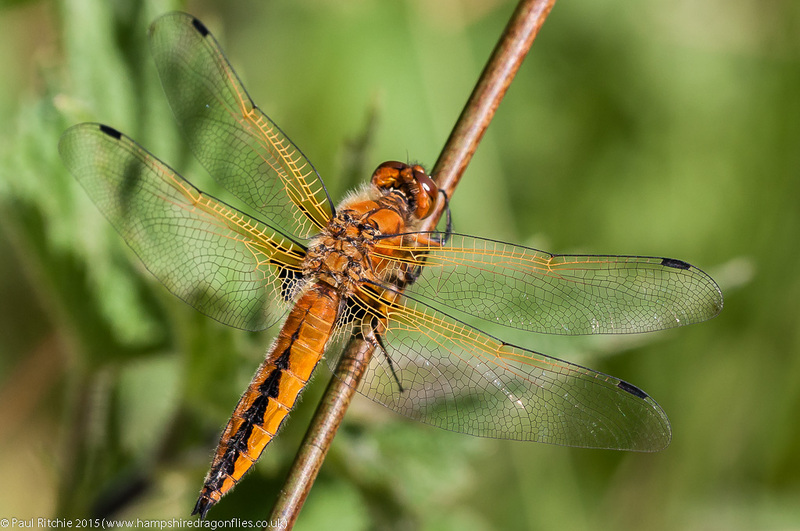 Having explored every possibility, I moved on to Kilwood Copse and found it too was lacking, except for a Broad-bodied and Scarce Chaser. Under these blazing skies I should’ve seen plenty. As I was in the area, I decided to visit Studland Heath as a last resort. I could quite easily had returned to the car and given up on seeing the wreckage of the gorse clearance. Ruined. This once fine feeding ground was no more. Heading back to the car I explored a couple of small sheltered clearing where at last I found my Downy. Mission accomplished then, but damn hard work. 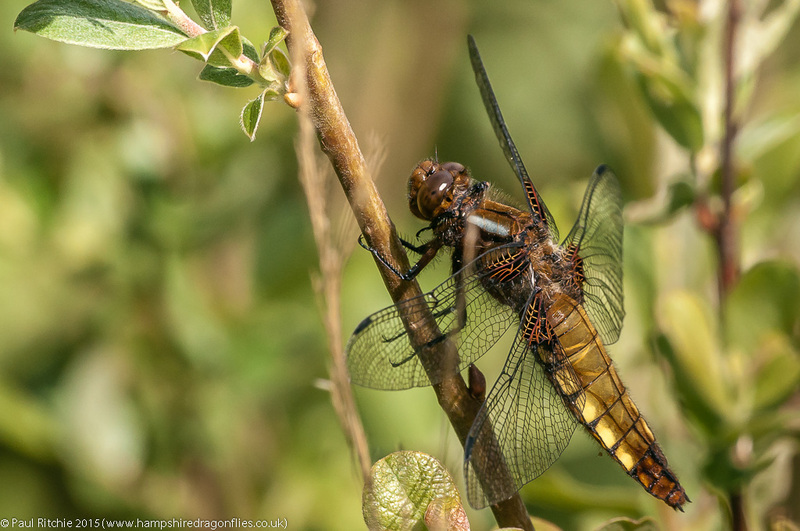 Also sharing the clearing was a female Four-spotted Chaser chowing down on a rather large grasshopper. This prevented her from travelling too far out of reach, but she wasn’t in the mood for sharing. 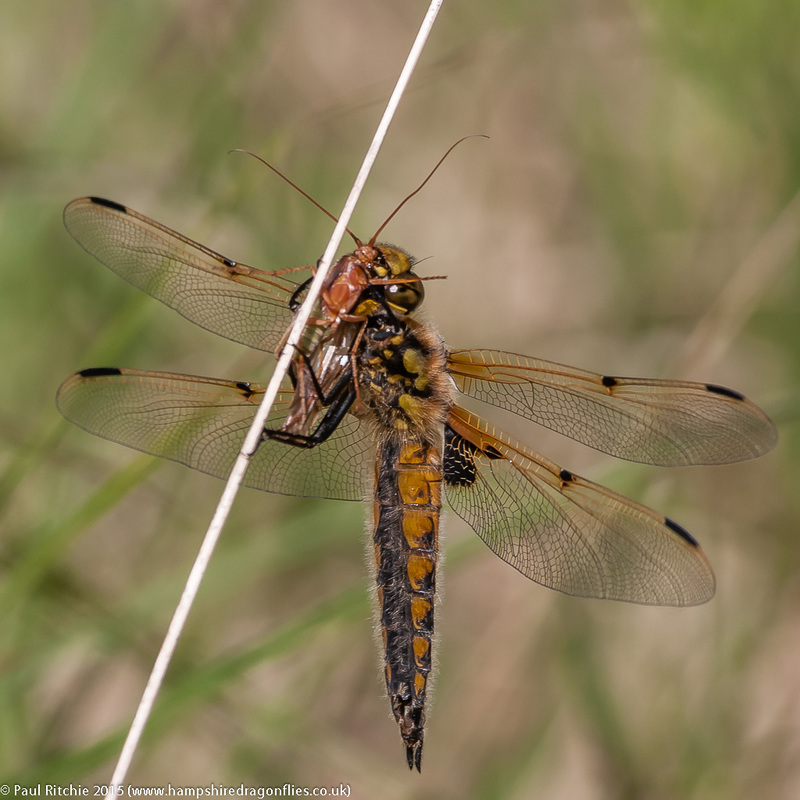 I called in to Troublefield for an hour on the way back and kept myself occupied with the Demoiselles, Butterflies, a Broad-bodied Chaser and , finishing with a Scarce Chaser on the way out. Now the day had been worth it! 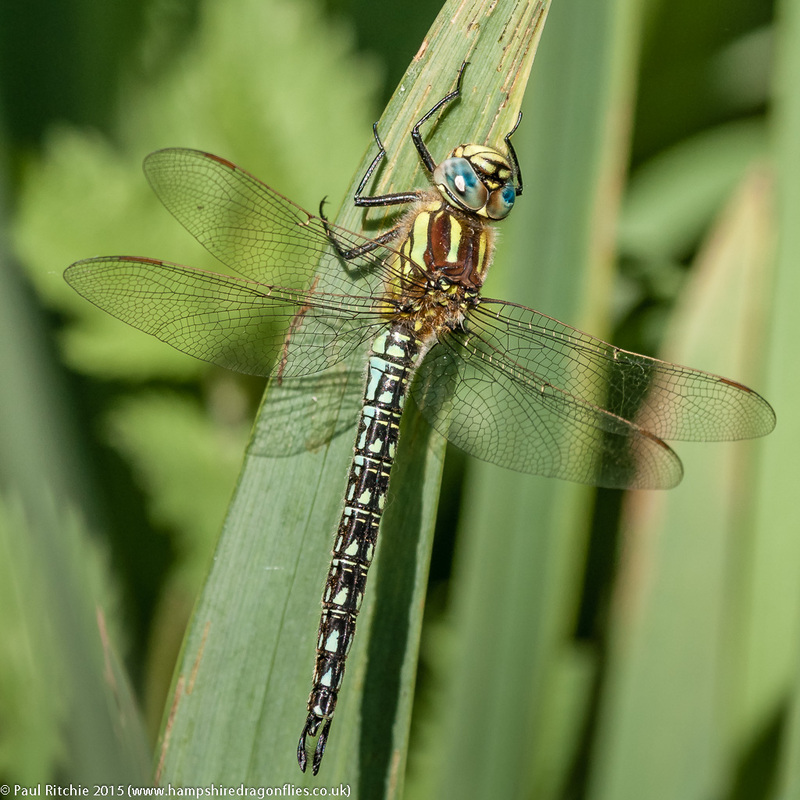 Certainly the best dragonfly day this season and the best ever encounters with Hairy Dragonfly and Scarce Chaser; not to mention the Four-spotted and Broad-bodied. A truly wonderful day and quite frankly I could leave it here and tease (or annoy) the hell out of you. Let’s try a few comparisons. 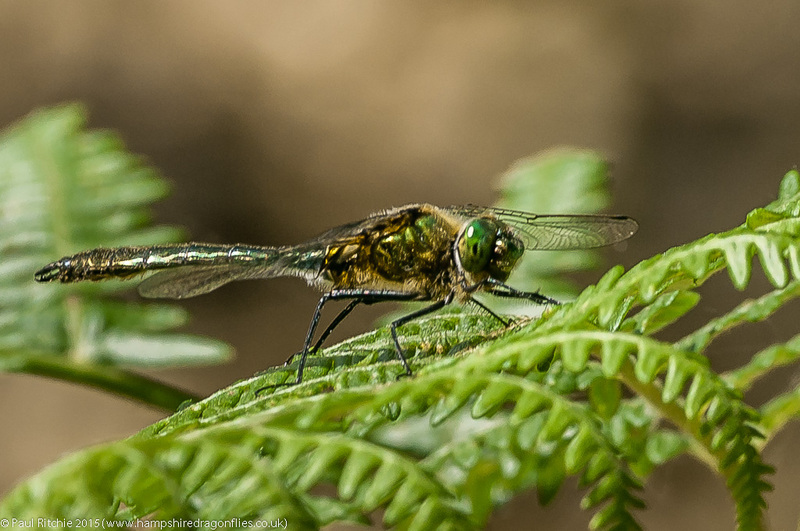 Kent last season at Westbere and Cliffe, (my previous nemesis) the Brilliant Emeralds at Ashdown Forest. 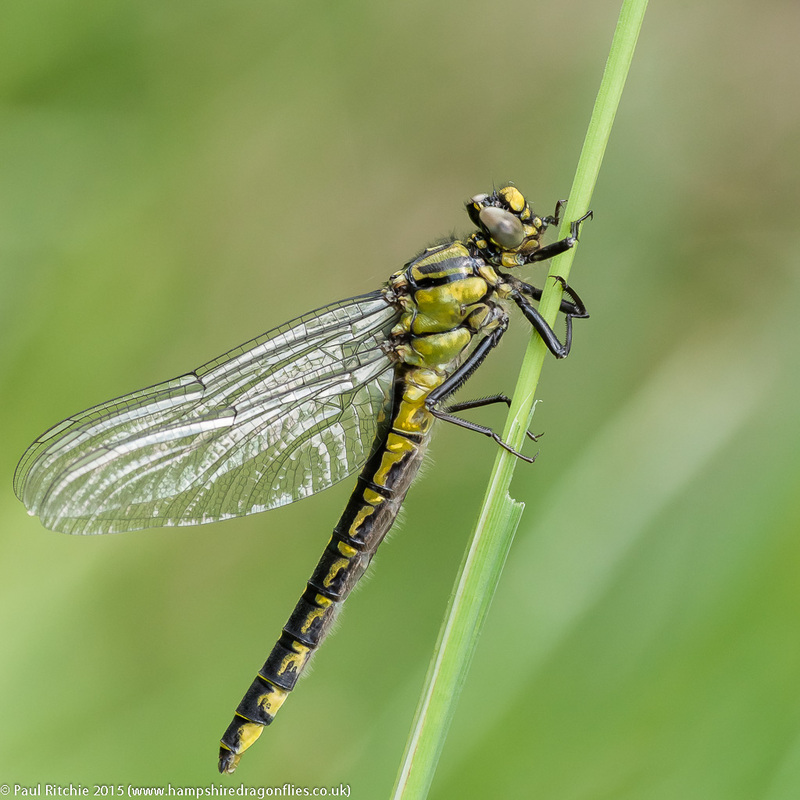 ; a good day at Crockford, Latchmore or Ober Water. Days to remember. Where were we? The Somerset Levels on a very windy day; but at least the sun was shining. 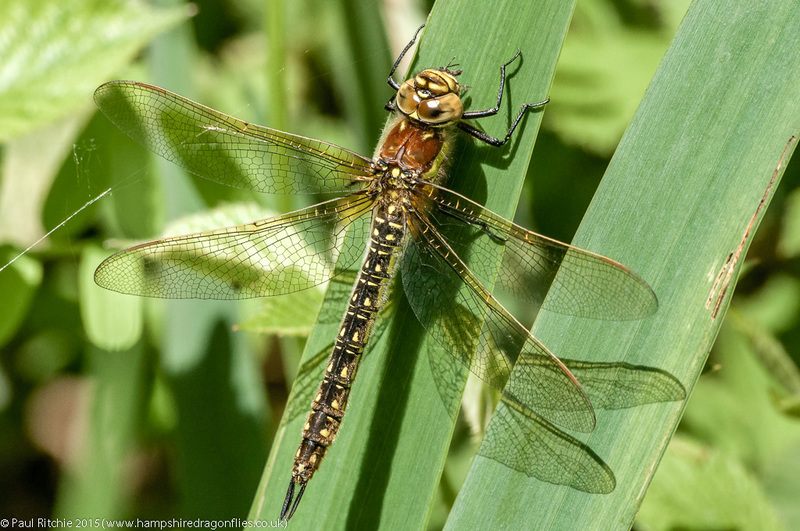 The strong breeze would normally deter a dragonfly jaunt, but if the sun’s out and the temperature is high enough, they’ll be out. A few shockingly bad navigation errors on route meant we completely missed the A303 and witnessed some new scenic delights; which is all well and good if you’re on a road trip, but we had a mission and we couldn’t wait to get to our destination. As it turned out, we arrived more or less on schedule. Them old Somerset ‘A’ roads can be quite friendly out of peak holiday season. 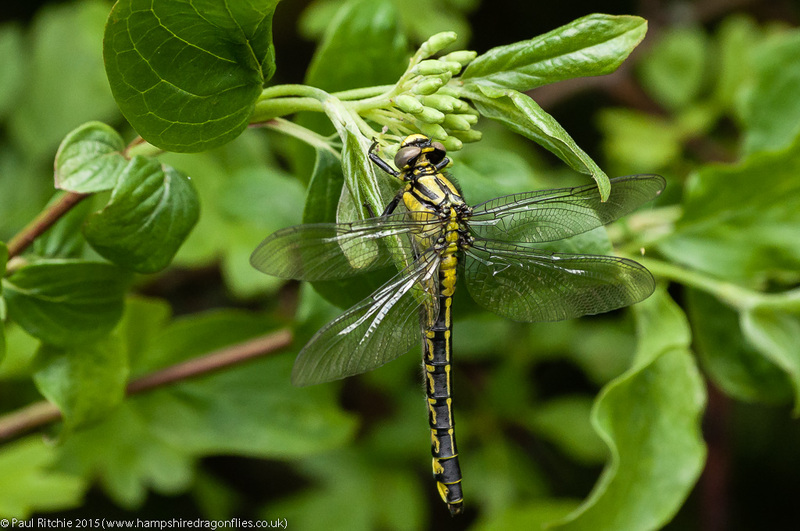 Wellies on and cameras primed, we went through the gate and busied ourselves with the damsels sheltering out of the wind in a bramble bush, trying to pick out the (New Forest unfamiliar) Variable from the swarms of Azures. 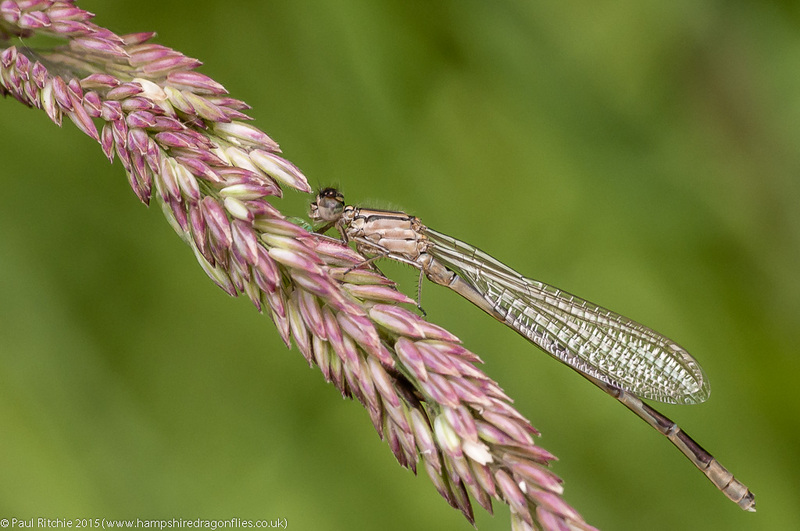 While we filtered through the damsels a male Hairy conveniently decided to perch right in front of me. First one of the day, closely followed by a female. A better start you couldn’t have wished for. 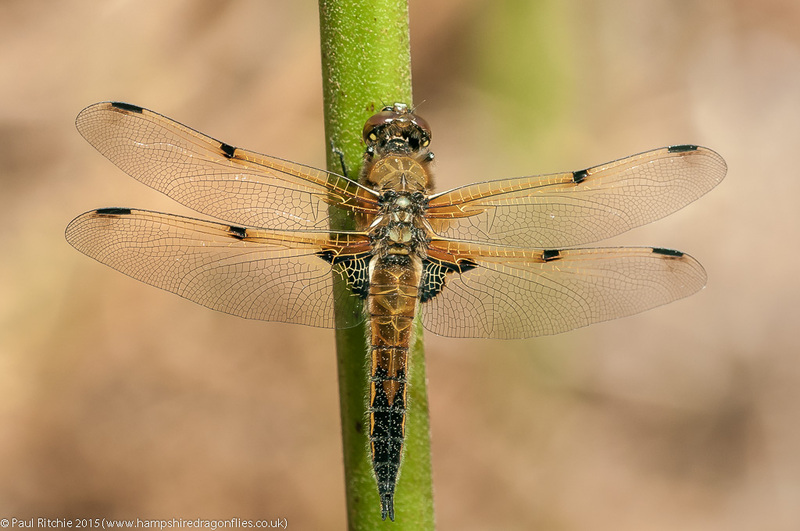 As we travelled further down the track searching the grass for more damsels I flushed a Scarce Chaser, followed it for a while before we noticed more than a few more decorating the undergrowth. 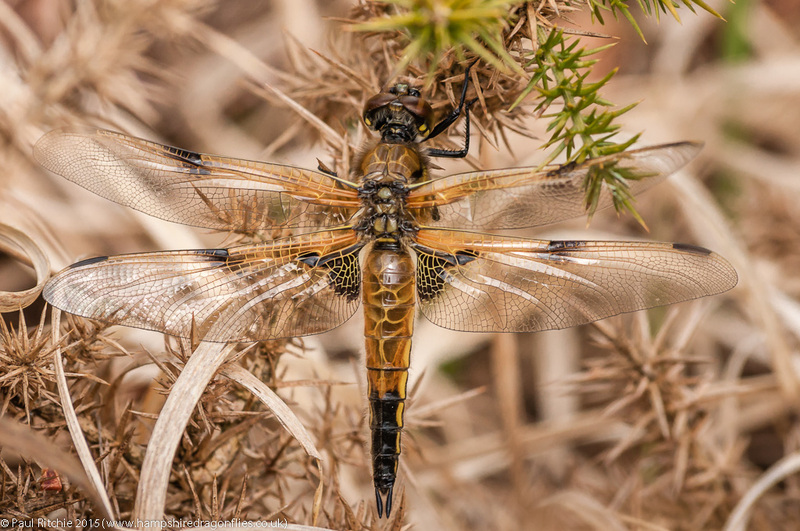 Shortly after a few Four-spotted Chasers rose to join them, but the best was yet to come. 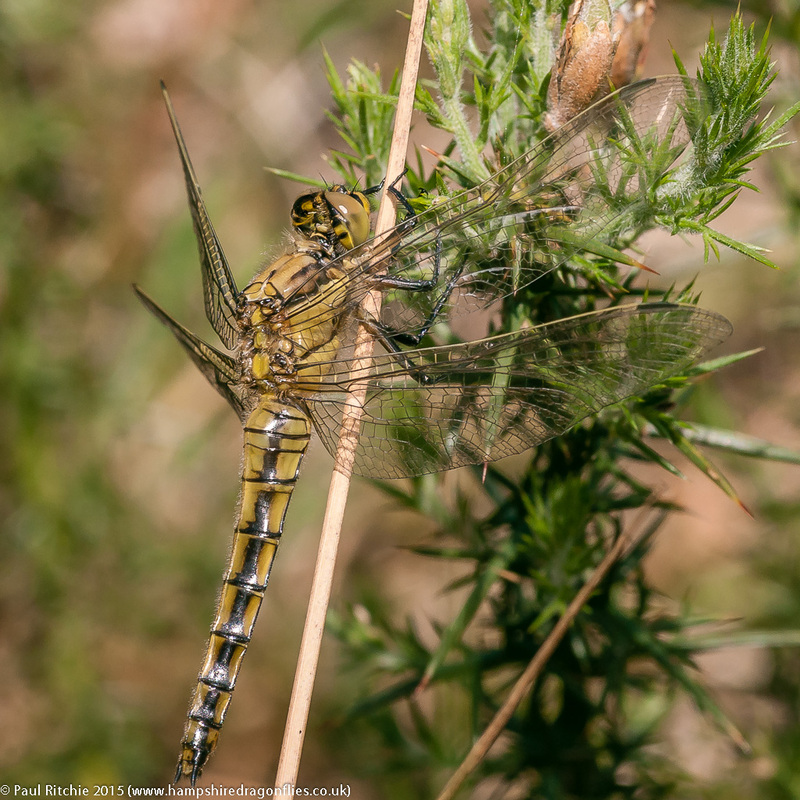 The next location turned out to be the spot of the day; a cracking meadow which had all the signs of a perfect dragonfly feeding area. Hairy’s, Scarce, Four-spotted and Broad-bodied stalking, feeding, sheltering; almost every footfall flushing out a new prize. It certainly put Troublefield in it’s place. We spent a couple of hours here before taking a stroll up the recently-extended Sweet Track; recently restored would be a better description, this being an old Neolithic route. I must give proper praise to this superb sheltered path, bordered by a stream and peppered with bountiful clearings. 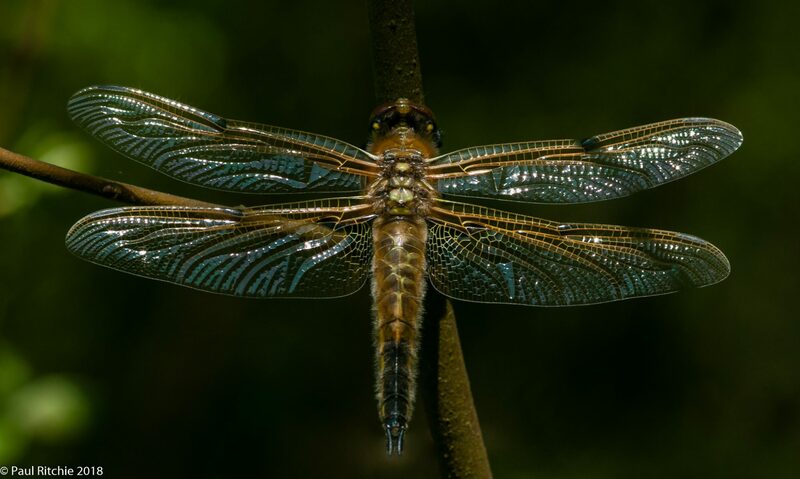 Any dragonfly nut would feel they’d entered nirvana. Such a perfect setting which doesn’t disappoint. After a spot of lunch we returned to the meadow and were joined by Jerry and Steve, who had spent the afternoon at Westhay. We had planned to move on to Westhay after Shapwick, but why bother? We had all we needed right here. A very worthwhile day in the land of plenty. Now wasn’t Wednesday pleasant? My plan was to spend a few hours just chilling out at Troublefield; basking in the sunshine while Demoiselles and Butterflies decorating the skies. But first I fancied scouting out a new area near Christchurch and having a quick jaunt around Ramsdown. Nothing doing, so back to my plan…which had already taken a diversion with a call from Doug asking if I was about. I was, so we arranged to meet at the meadow. 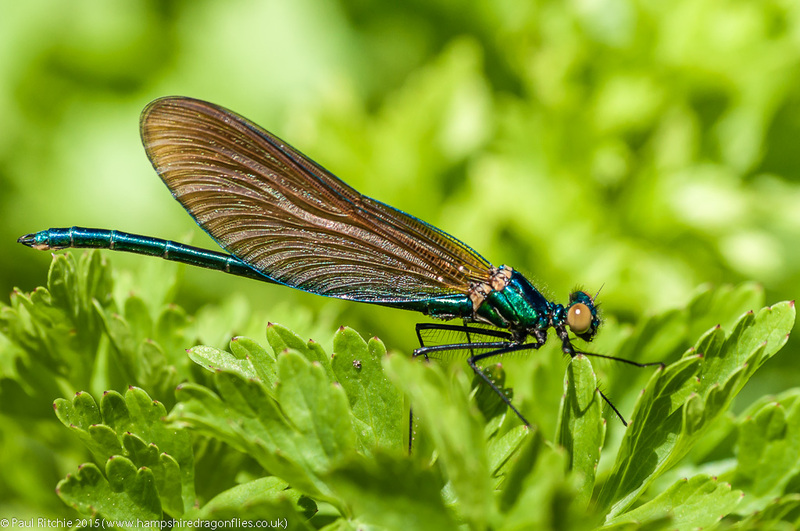 Not nearly as prolific as Monday, so I busied myself with a Beautiful Demoiselle while I waited. 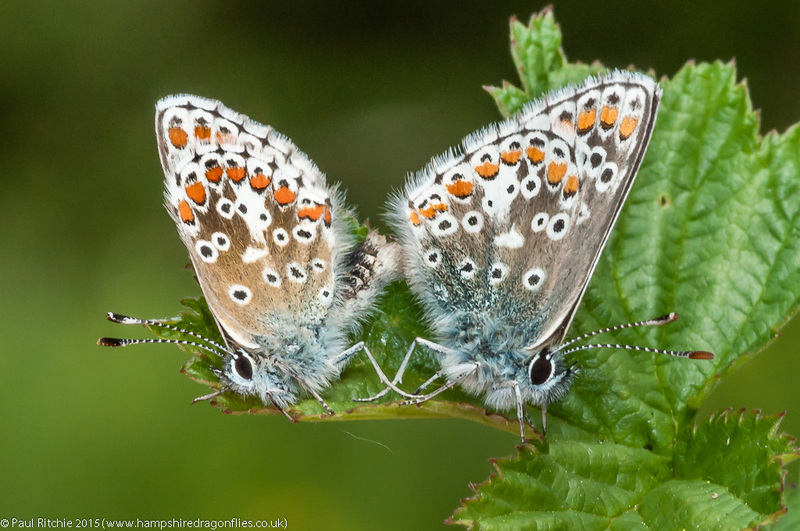 A mating pair of Brown Argus provided the next challenge. 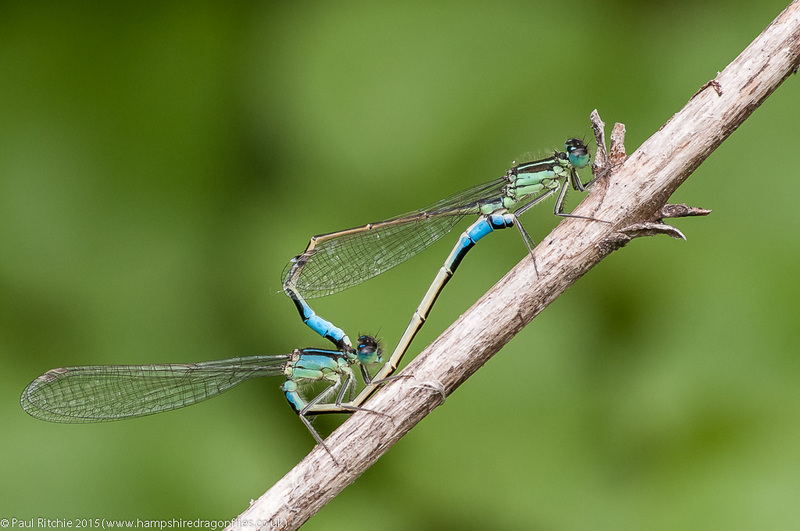 Pinning down Demoiselles while they’re fresh can be an enjoyable challenge, and getting them to remain still should they choose a perfect perch can be as frustrating. This male Banded chose to remain long enough to provide one of the better opportunities of the day. Doug arrived shortly afterwards and we flushed through the undergrowth looking for something different. 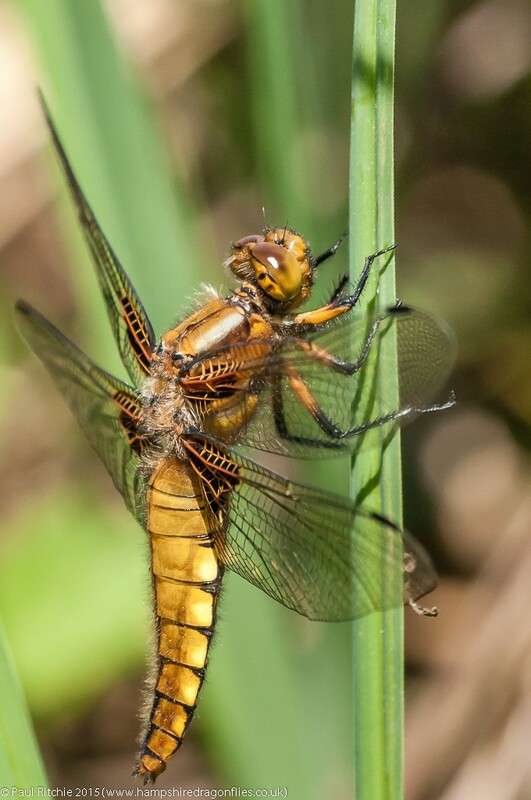 Thankfully we were rewarded with a female Broad-bodied Chaser. That proved to be it for larger species, so we moved on to Dunyeats Nature Reserve. 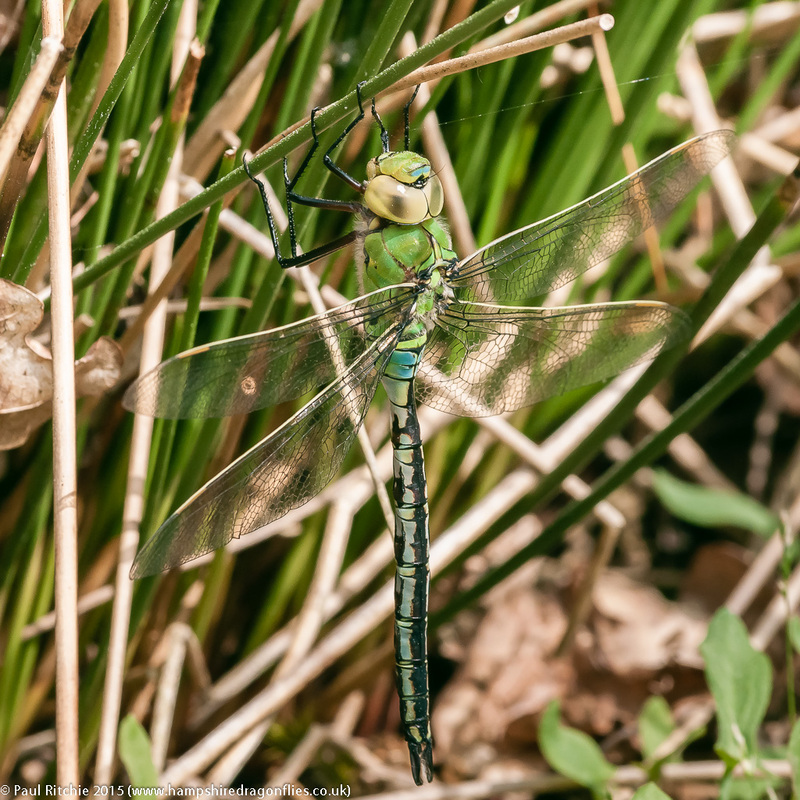 Barely through the gate we had a female Hairy ovipositing among the reeds, while a Downy Emerald disappeared across the heath. 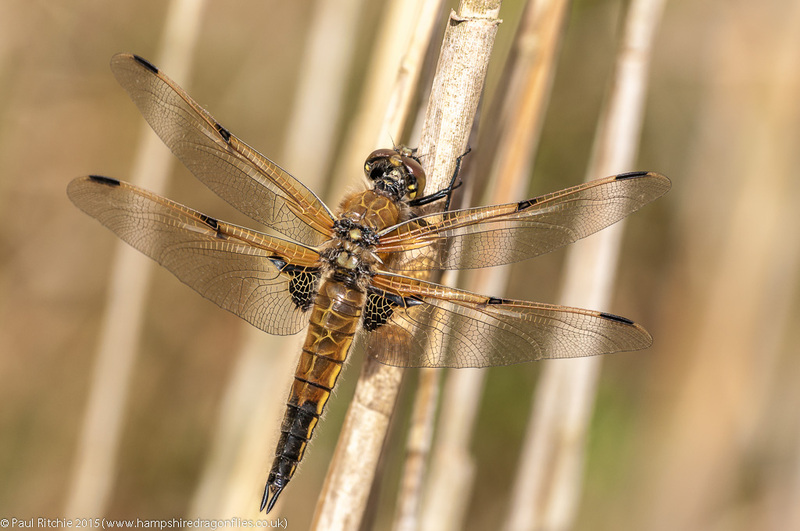 By far the most prolific were the Chasers, with at least half-a-dozen ‘blue’ males battling across the water and several fresh Four-spotted decorating the heath. 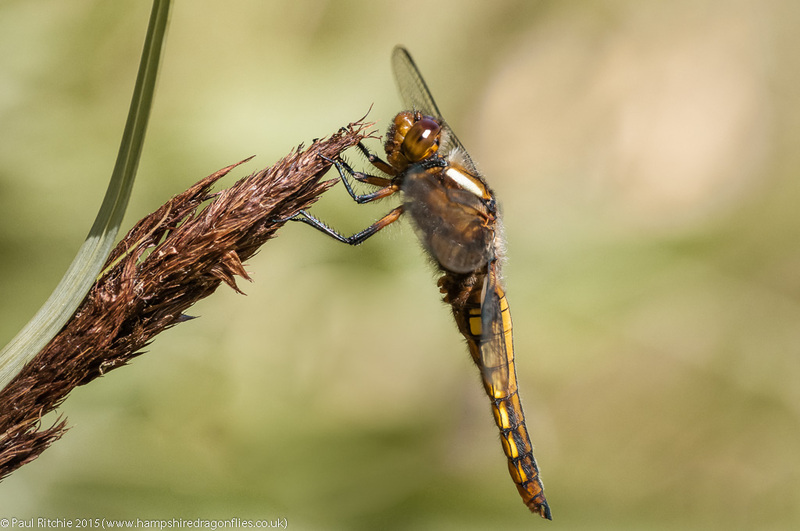 Damsels were represented by Large Red, Azure and a few Common Blue, which provided another new species for the season, while back in the reeds Doug noticed an emerging Four-spotted Chaser. A pleasant two hours sadly curtailed by the increasing cloud cover, but our first activity over water meant that Spring had finally arrived. Just in time for the following day’s washout! On Sunday afternoon Sue & I nipped into Swanwick NR to check on progress. At the dipping pond was a solitary Large Red while in the grass surrounding were a couple of immature Azure. One of the positive improvements has been the opening up of the stream, providing a perfect little sunny spot next to the footbridge. Although not in large numbers, the scrub threw up some more Large Red, more Azure and a few Blue-tailed. This proved to be the key spot here today. More Azures and an immature Red-eyed populated the scrub inside the gate, and at the entrance to the fishing lake we saw our first Downy Emerald of the season. Unfortunately too high up in a tree to obtain anything but a lousy record shot, but at least we had a decent view as (she) flew off west over the treeline. An incredibly frustrating day due to the weather. The forecast promised some sunny spells, so it should have been worth it? Alas an infinite gloom surrounded the south side of the forest, but I decided to carry on with my whistle-stop tour. I was eager to check on progress at Badminston; the last news being the creation of a nature reserve from the old clay workings. The main lake is now under the ownership of Cadland Fisheries along with the attendant ‘keep out’ signs, but at least for now the plateau remains more or less intact bar the odd landscaping and increasing, in places, prohibitive growth. 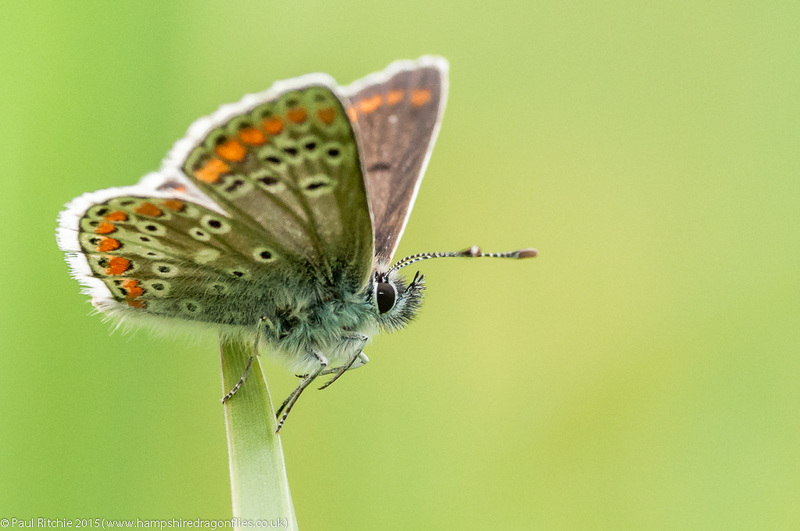 A circular tour should have at least thrown up a Common Blue, but not in this gloom. I don’t know why I chose to call in on Hawkhill. Well, to keep things up to date I suppose. It was just as I imagined. Fruitless. Mind you, so was the eastern corner of Hatchet Pond (the big ‘tourist’ one). The smaller ponds weren’t any better, with not so much as a Large Red showing themselves. It wasn’t until Pennington that I finally saw signs of life. The fast-growing undergrowth providing a strong cast of immature Azures. 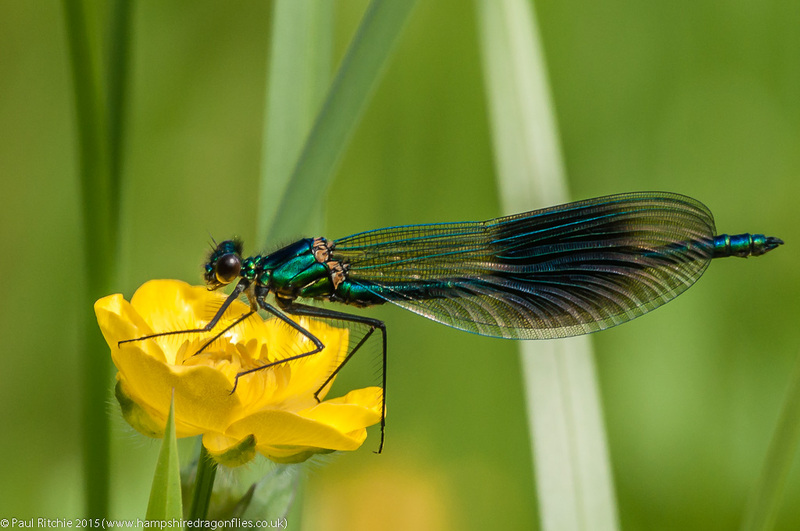 Alarmingly I didn’t see one Blue-tailed., just a few Large Red, a few each of Banded and Beautiful Demoiselles and a couple of Red-eyed. Fed up with this claustrophobic gloom, I decided to head north to Troublefield. At least here I should find some treasure. I did. Pure gold, as the sun finally made an appearance. Barely over the gate I was greeted by my first Small Copper of the season. A good attendance from Small and Green-veined White, Orange-tip, Peacock, Comma and my first Brown Argus of the season. 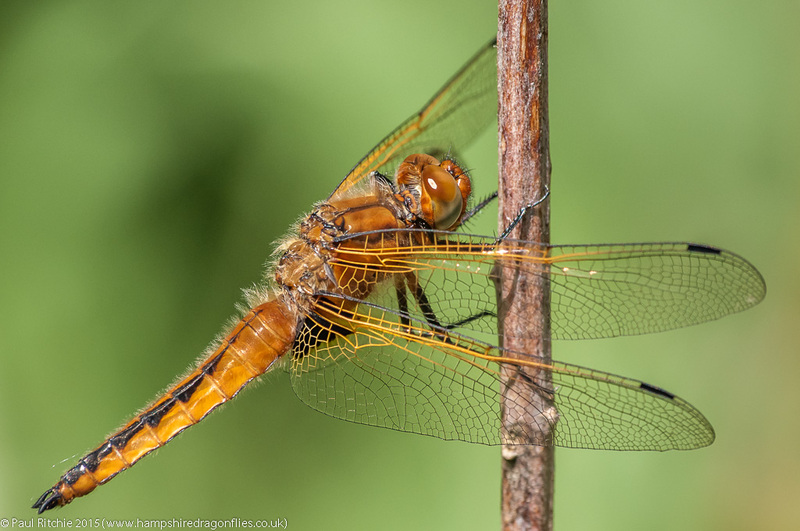 Dragonflies were represented by more Beautiful and Banded Demoiselles – still low numbers, but most welcome, and almost an opportunity to get close enough to a Broad-bodied Chaser. Another week and this micro-climate should really come alive, providing of course they keep the cattle at bay. 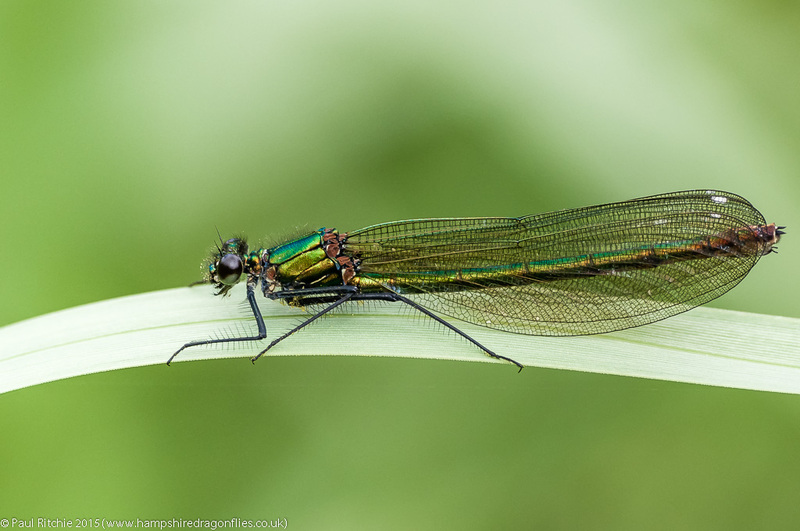 One purpose on this changeable day…to find some Beautiful Demoiselles at Durley Mill. I’d been checking every other day from the middle of last month, but it’s over a fortnight since I last visited due mainly to the weather. We needed a couple of days of uninterrupted sunshine to warm the valley. Glad to say we were lucky today, although I knew they’d be around after recent sightings in Cornwall and Wales. The first immature male was found near the path, but I had to delve deeper into the valley to flush out a few more. In all I’d say I found around eight males and four females, and I’m sure if I’d stayed longer I could’ve flushed out a few more; but I had what I came for. A Bank Holiday trip to Bentley Wood for the Pearl’s brought a welcome feeling of relief at the improved condition of the ponds! If I’m perfectly honest, I had no desire to take the walk; deeming it unnecessary and a probable disappointment after recent years. Imagine my surprise to find the main pond has undergone a massive clean-up with the several trees – including the one on the island – and all the choking reeds removed. The surrounding area has been levelled to the extent you can actually see the pond from the path! Although the only odo’s we found during our visit were Large Red, they were up considerably on previous seasons numbers. Give it a few weeks and this now very pleasant and picturesque pond should play host to a fabulous airshow of Chasers. Who knows, maybe even a Downy or two. 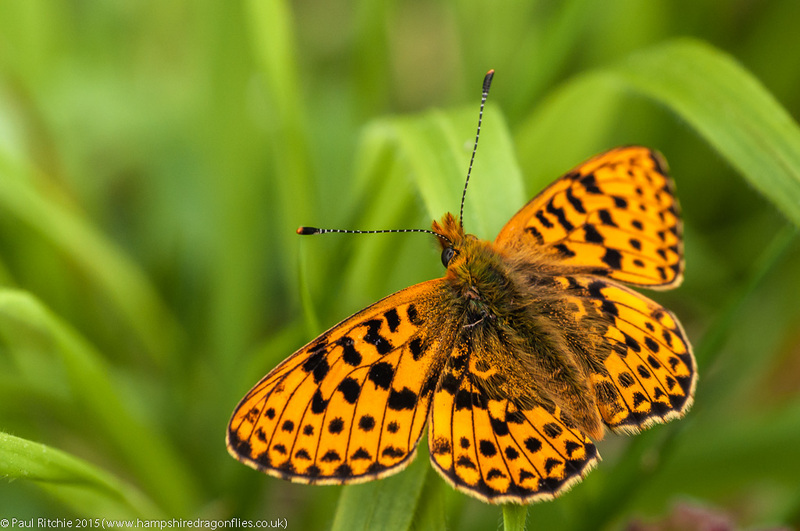 Our main reason for a visit were the Pearl-bordered Fritillary, for which they’ve done a fabulous job of creating suitable clearings, so well done to those responsible for woodland management at Bentley to include this long neglected pond in their improvement plan. I very much look forward to including it once again in my seasonal rounds. It’s been a few years since I’ve ventured to the Oxon/Berks border in search of the Club-tailed, but as there’s been a recent upsurge in interest I decided to do a scout; figuring if they’ve been seen as early as the 1st May on previous years, there may be a chance. I arrived in Goring under heavy skies and a rather long shower; so long I decided to move on after waiting for it to clear. Thankfully as I approached Lower Basildon the rain stopped, so I decided to continue with a search along the south bank. Those sunny spells were reluctant, but at least it was dry. Deciding to head upstream for a change, I checked every available patch of growth and all shoreline reeds I could get to, striking lucky at one particular small bay which had been used as a drinking spot by the present cattle. 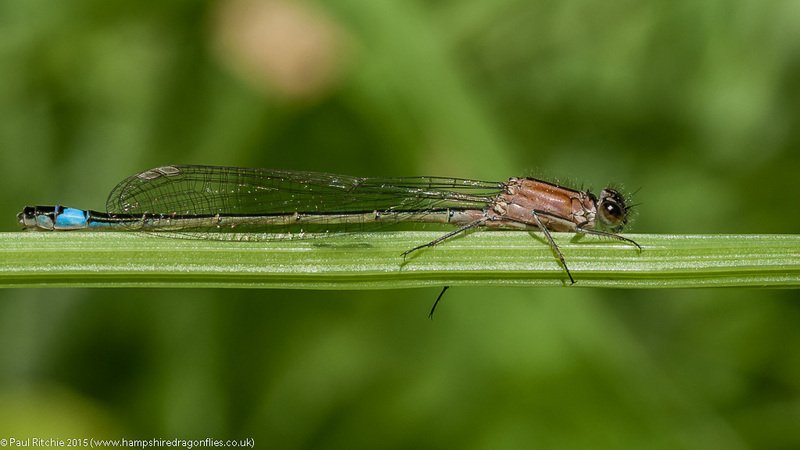 The reeds had been half eaten, but on the remaining stems I discovered two spent (Common Club-tailed) exuvia. This filled me with renewed energy and faith and, after I removed one of the exuvia to take home, I retraced my steps and continued downstream to it’s furthest extent. 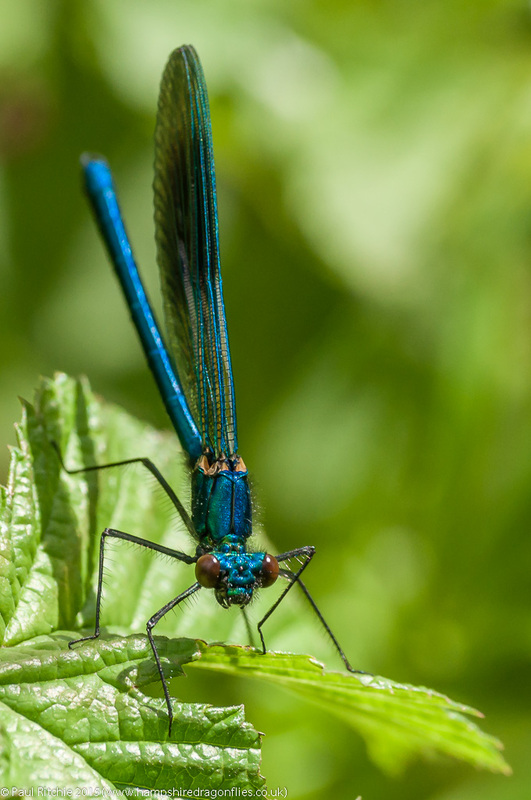 I didn’t find any more exuvia, but I did at least encounter my first Banded Demoiselles of the season. Still driven on by faith, I returned to Goring and did a circuit, searching the bridge parapet and surrounding undergrowth to no avail, but at least there were a few more Banded. Satisfied with my discovery I decided to call in at Bramshill Common on the way home in the hope of finding something else. 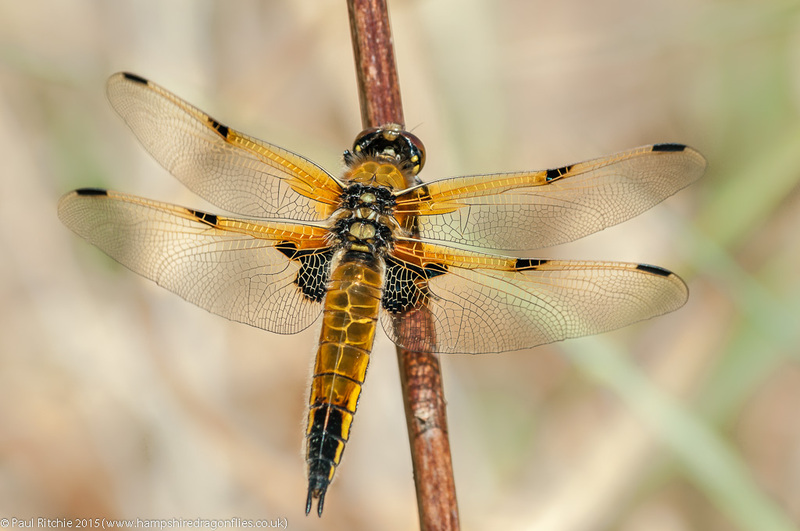 It wasn’t long before I found my first Four-spotted Chaser rising from the reeds and giving me a welcome chase. A search of the clearing revealed a number of Large Red and a few Blue-tailed, as well as good numbers of Grizzled Skippers, ut by now the skies had darkened somewhat and it was noticeably cooler, so I didn’t expect much else. 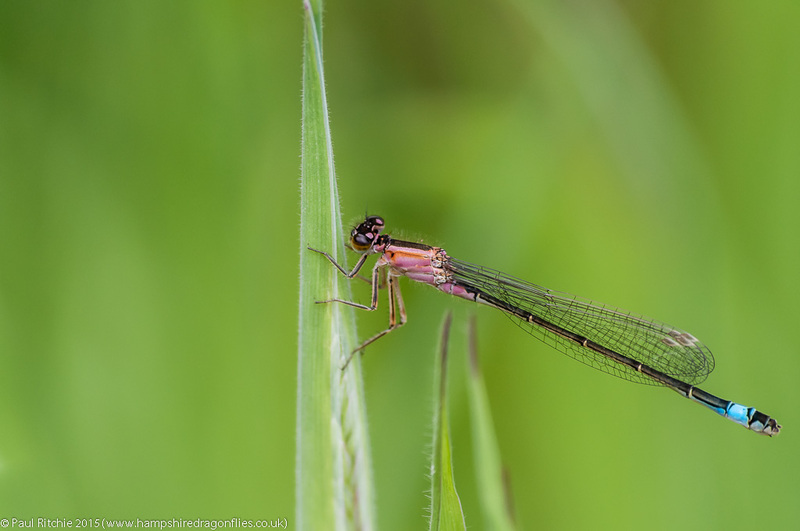 Thankfully a favourite little hollow contained an array of sheltering damsels – more Large Red, a few more Blue-tailed and my first Azure and Red-eyed of the season. I’m glad I called in! 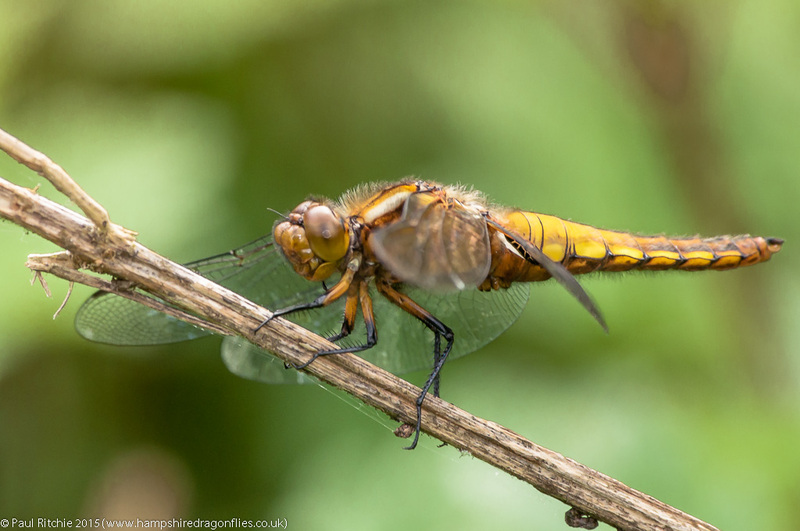 Once again we’ve been spoiled by a fortnight of glorious temperatures which kick-started the emergence of many species across the south and elsewhere, but things appear to have come to a juddering halt around here for now. 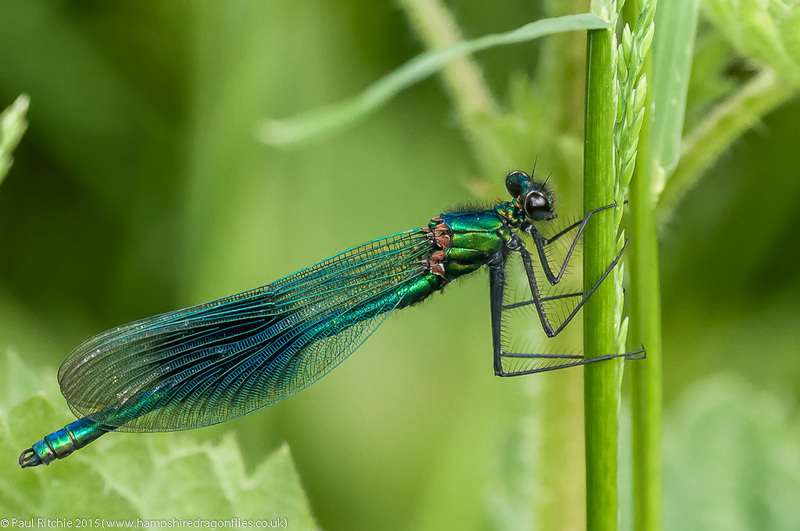 I thought a shower might raise the Demoiselles, but already we’re a fortnight behind last year’s emergence; which is probably normal. The foliage is growing nicely, offering much needed shelter, but where management has been, shall we say, a tad severe, the situation is a tad bleak. A return visit to Titchfield on Monday should have produced an improvement on the previous week, but all I could muster this time around were a couple each of Large Red and Blue-tailed. 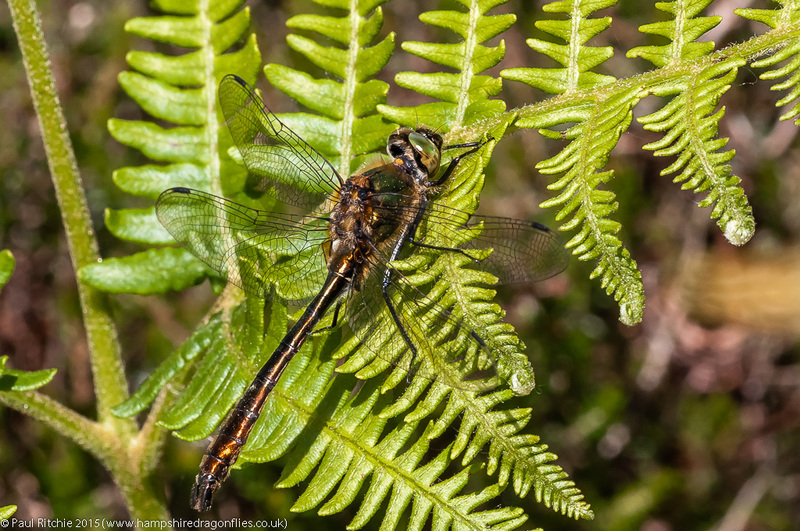 My second visit this season to Cadnam Common at least provided me with a couple of flighty Broad-bodied Chasers. Flighty enough to elude me, and eager as I was to chase them across bog and moor, they’ll be plenty more to choose from soon. A welcome splash of rain is giving me chance to step back a little; a little over-eager as usual so soon in the season. The frost yesterday morning should have warned me to stay indoors, but I couldn’t refuse the sunshine regardless of the temperature. 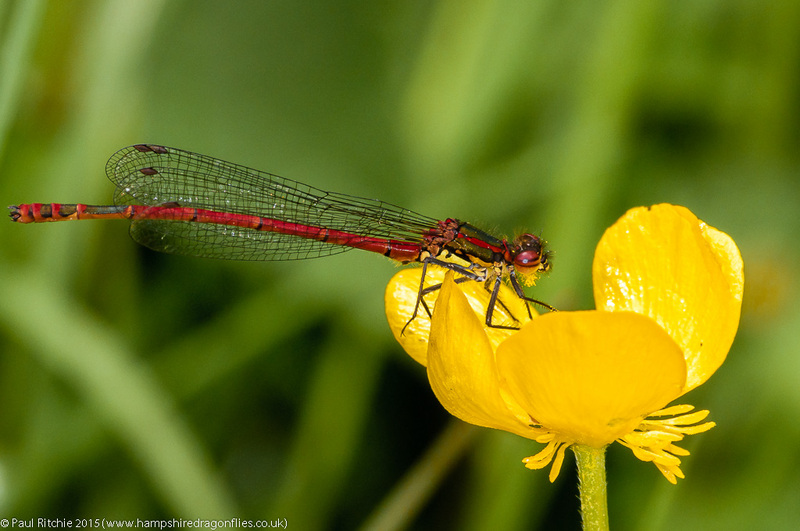 As it was I found nothing at Swanwick Nature Reserve and little else (except Large Red and Blue-tailed) at Pennington, Crockford (Large Red) or Hatchet Moor (Large Red again).